R&J #383 - R.I.P. Tagi - The Mike O'Meara Show The Mike O'Meara Show R&J #383 - R.I.P. Tagi - The Mike O'Meara Show | A fun mash-up of real life, pop-culture, news of the day, dynamic audio clips, and three guys busting each others’ balls. 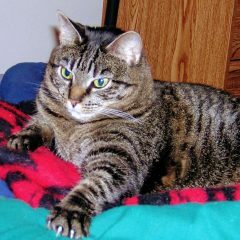 A beloved pet, mentioned many times on the show, has gone to kitty heaven. Chris Restivo posts a video rant when the Vikings show poorly against the lowly Bills. Joe not only calls someone by the wrong name again on the pre-game show, he also insults a guest and dares to use a joke involving skin color. Gramps cuts a new promo and there a plenty of his antics to discuss. Rob is a keen observer of couple dynamics and spots an emasculated man in a hotel lobby. Robby gets more criticism about his audio drops. Katie’s father hears a segment on 98 Rock where Joe divulged a little more personal information than Frank wanted to hear. An embarrassed Katie joins the show, yet even more is revealed. Rob and Joe talk about Justin Schlegel’s recent stop at TMOS on his Las Vegas show promotional tour. Katie takes a page from the Robby/Tawanda playbook. Joe’s neighbor opens with an insult when she asks him for a favor.